In what started as a 500 word blog post that drew an exceptional response, I AM A CHURCH MEMBER: Discovering the Attitude That Makes the Difference takes a hard look at the unfortunate state of church membership – self-serving, disengaged, and minimally committed. On a mission to spark new life into the membership of the church, Rainer explores the cause of this biblical disconnect and unapologetically addresses what is expected of those in the church. Further, he outlines six ways Christians can recommit to the church. Thom S. Rainer is president and CEO of LifeWay Christian Resources. A respected pastor and researcher, he has written more than twenty books and coauthored the No.1 best seller Simple Church. Rainer and his wife, Nellie Jo, have three grown sons, several grandchildren and live in Nashville, Tennessee. This book is exceptional in regards to showing how our churches have become something other than what God intended. We have a different idea of what membership means than what God said when He said we were members of the body of Christ. This little book (it's only 79 pages long) had such an impact on how I viewed myself as a member of my own church. Mr. Rainer shares the following six impact statements to help us make the attitude adjustments necessary to make changes as a church member and church body. 1. I will be a FUNCTIONING member of my church. 2. I will be a UNIFYING member of my church. 3. I will not let my church be about my preferences. 4. I will PRAY for my church leaders. 5. I will lead my family to be healthy church members. These are simple yet such profound statements that he goes into depth on. It's all about being less self-centered and being more self-sacrificial. This book really does make you want to figure out how you can serve your church rather than have it serve you. This book really should be read by every Pastor, Elder and church member. It would help us to make our churches more Christ centered and would make such a huge difference in how our churches could have an impact in our lives. 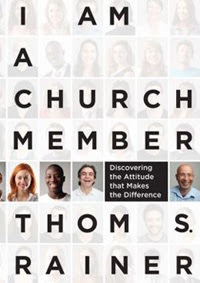 This is a very quick, enjoyable read that will make a huge difference in how you view yourself as a member of your church. I highly recommend it! Praying for rain to come to you Julie. Take care friend.